In a sweeping review of the field of bio-inspired engineering and biomimicry in the Feb. 15 issue of the journal Science, two engineers at the University of California, San Diego, identify three characteristics of biological materials that they believe engineers would do well to emulate in man-made materials: light weight, toughness and strength. Joanna McKittrick and Marc Meyers, from the materials science program at the Jacobs School of Engineering at UC San Diego, examine the three characteristics in a wide range of materials, from spider silk, to lobster and abalone shells, to toucan beaks and porcupine quills. Lessons learned from these materials could lead to better body armor, lighter aircraft and stronger, more flexible materials, researchers said. 3-D printing offers new opportunities to fabricate these materials, engineers said. "An abalone doesn't grow a shell overnight," McKittrick said. 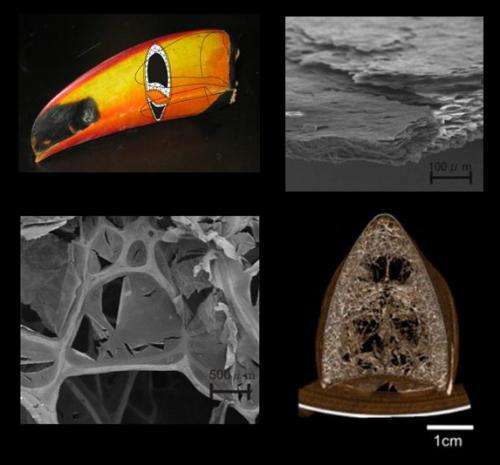 "But you could build a material similar to the abalone shell using principles we learned from nature by printing layer upon layer of mineral deposits—and do it much faster than nature would." X-ray diffraction to electron microscopy; and developed tests of materials' mechanical properties at the nanoscale, to understand the underlying structure of materials found in animals and plants. "Mother Nature gives us templates," said McKittrick. "We are trying to understand them better so we can implement them in new materials." "We outline the mechanisms that can help us elucidate the properties of biological materials," Meyers said. Bio-inspired designs have been a part of science and engineering for a long time—from the legend of Icarus, to Leonardo Da Vinci's flying machines, inspired by birds, to modern-day materials such as Velcro, Meyers pointed out. Tough materials deflect cracks by erecting various obstacles that prevent cracks from propagating in a straight line. Materials in nature use various strategies to achieve this result. One is to embed stretchy collagen fibers in brittle minerals. Another is the use of interfaces between layers of materials to create obstacles. 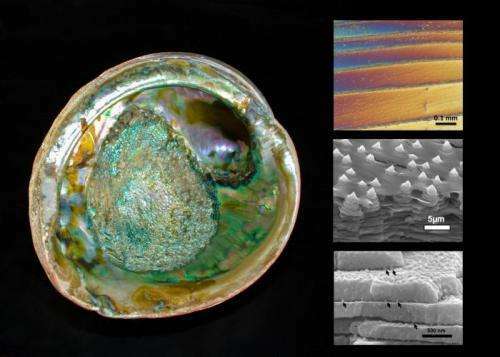 For example, at the nanoscale, an abalone shell is made of thousands of layers of "tiles" made of calcium carbonate (more commonly known as chalk), about 10 micrometers across and 0.5 micrometer thick—about one-one hundredth the thickness of a strand of human hair. The irregular stacks of thin tiles refract light to yield the characteristic luster of mother of pearl. They are organized in a highly ordered brick-like structure arranged in the toughest configuration theoretically possible. A key to the strength of the abalone shell, Meyers said, is a protein adhesive that binds to the top and bottom surfaces of the calcium carbonate tiles. The glue is strong enough to hold layers of tiles firmly together, but weak enough to permit the layers to slip apart, absorbing the energy of a heavy blow in the process. Abalones quickly fill in fissures due to impacts, and they also deposit "growth bands" of organic material during seasonal lulls in shell growth. The growth bands further strengthen the shells. Meyers believes that designs inspired by the structure of the abalone shell could help improve advanced ceramic materials in the future. Animals have developed incredibly light yet tough structures compatible with motion, including flight. Think of bird feathers, porcupine quills and bird beaks. These structures are made of materials that don't bend while being as light as possible. Most are made of tube-like structures with a fairly large diameter. But when the tubes' diameter reaches a certain size, they become increasingly likely to buckle. To increase resistance to buckling, the tubes are then filled with a foam-like substance. For example, the interior of the toucan's beak is rigid "foam" made of bony fibers and drum-like membranes sandwiched between outer layers of keratin, the protein that makes up fingernails, hair and horn. The result is solid "foam" made of air-tight cells that gives the beak additional rigidity. Like a house covered by a shingled roof, the foam is covered with overlapping keratin tiles, each about 50 micrometers in diameter and 1 micrometer thick, which are glued together to produce sheets. Meyers said the bio-composite found in the toucan's beak could inspire the design of ultra-light aircraft and vehicle components. The researchers also describe other strategies to make lightweight objects. Some bird wing bones have strut-like structures inside them as reinforcements. Bamboo is made of segments that don't crack. "Natural systems are built from so few elements, yet they use ingenious ways to assemble all these different materials to maximize their properties," McKittrick said. Biopolymers, such as collagen, are a key component of strong natural materials. At lower stress levels, they can undergo considerable stretching, their molecules uncoiling and unkinking, without breaking. At higher stress levels, it's the polymer's backbone itself that stretches. These biopolymers are found between stiff minerals, giving materials their natural strength. For example, spider silk has both high tensile strength and extensibility. "It's stronger than almost any material," Meyers said. The si¬lk is made of pleated sheets of nanocrystals connected by weak hydrogen bonds and embedded in protein strands. Under low stress, the protein strands uncoil and straighten, much like biopolymers. Under larger stress, the load gets transferred to the nanocrystals. If necessary, some of the hydrogen bonds slip, allowing the structure to stretch without breaking. Silk's reliance on hydrogen bonds for strength suggests that researchers may need to pursue new avenues to engineer stronger materials, Meyers said. Incidentally, similar structures can be found in bone, where sacrificial hydrogen bonds between mineralized collagen fibrils impart excellent fracture resistance. More complex strong structures can be found in everything from wool to whelk eggs. Beyond Velcro, there are multiple examples of bio-inspired materials and design. Swimsuits for competitive swimmers were built to replicate the ridges that reduce drag on shark skin (and were later banned from competition). Researchers at MIT have developed a surgical tape based on the structure of the gecko's sticky paws. Irregularities found on whale fins reduce drag and are now used in turbine blade designs. Researchers believe more, and better, materials are yet to come. "There are a tremendous number of examples of things we can't do with traditional materials," McKittrick said. 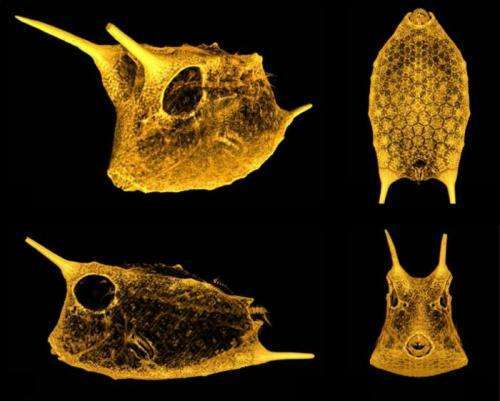 "It's going to take more time to make these bio-inspired materials. But they will be better." "This field is here to stay," Meyers said.